Hello crafty friends! Tracy McLennon here, and today I have Part One of my traveler’s journal project to share. 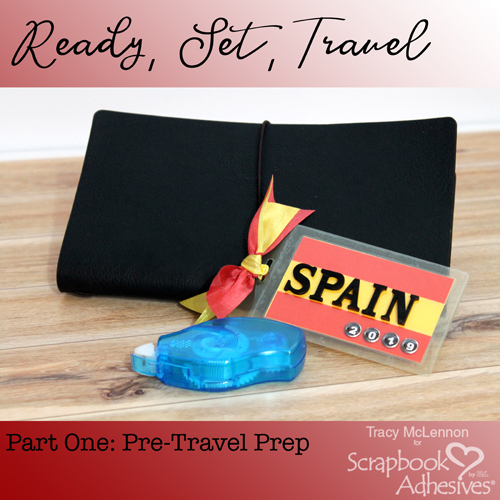 In March, my husband and I will be traveling to Spain. I wanted to share what I have done to prepare my travel journal for the journey. I have been a journal lover in the past, both for writing and drawing. But this will be my first traveler’s journal, and I am very excited about that. For this journey, I chose to start with a journal (cover, notebook, and inserts). 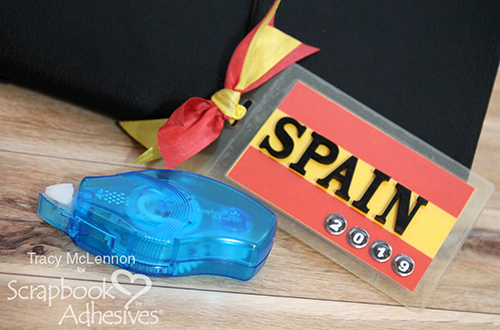 I used the yellow Self-Laminating Tag for the tag that I added to the cover of my traveler’s journal. 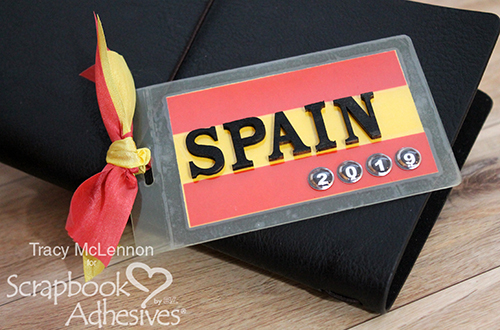 Inside the tag, I added yellow cardstock and red vellum to create the look of Spain’s flag. 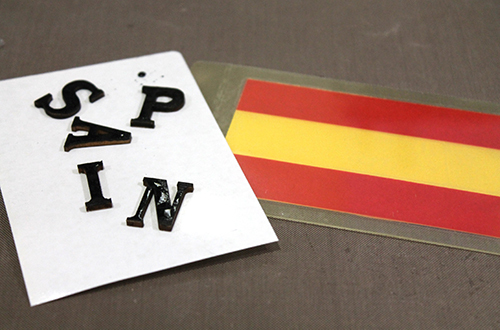 I then painted wood veneer letters black and added them to the tag using Adhesive Dots Micro. I didn’t use the loop to attach my tag to the book but instead used a silk ribbon. In the back pocket of my insert is where I will keep my Creative Photo Corners Kraft, Creative Photo Corners Black and my Keepsake Envelopes Mix. This way I will be able to easily pull out what I need while I create on the run. 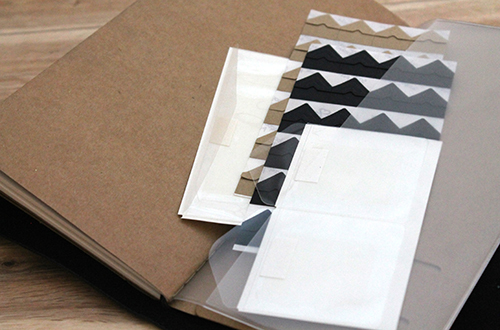 The Keepsake Envelopes Mix will be perfect for adding little bits and pieces of memorabilia. The final piece to take with me as I travel is my E-Z Runner® Petite Permanent Dots Refillable Dispenser. It’s perfectly petite to add to my travel backpack. This entry was posted in Adhesives, Beginner, Crafts & Tutorials, Creative Photo Corners, HomeHobby by 3L, Keepsake Envelopes, Mini Albums, Permanent Adhesive, Self-Laminating Cards, Skill Level, Tutorial and tagged Adhesive Dots Micro, Creative Photo Corners Black, Creative Photo Corners Kraft, Creative Photo Corners Mix Pack, E-Z Runner Petite Refillable Permanent Dots, E-Z Runner Petite Refills Permanent Dots, Keepsake Envelopes, Self Laminating Tags with Loop, Tracy McLennon, Traveler's Notebook. Bookmark the permalink.